Content creation can be an impossible task. After a content strategist has sketched out the grand plan, a copywriter must eventually write something. Pen hits paper. Keys rattle. Words emerge. And it’s all wrong. Horribly wrong. Marketing hates it, sales despise it, it makes the MD feel physically sick and someone in HR cried after reading it. Wrong, wrong, wrong. It’s too much wiffle, and not enough waffle. It doesn’t mention the G-Fex haemoglobber, or the Windlespan Chingnits. It doesn’t appeal to Middle England, and the language is too salesy, or not salesy enough, depending on who you ask, and the time of day you ask them. To sum up, nobody can agree on what the content should be like. And in part that’s because every person reviewing the content is considering too many things. They’re not just considering what is written, but also how it’s written. Getting copy approved by multiple corporate gatekeepers is easier when you split the task into two stages= content + style. And page tables are the perfect container for pure content. 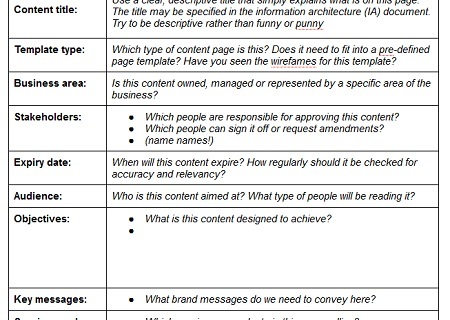 Page tables are just a document you use to record the content requirements for pages of your website. You can specify the key messages, the audience, the calls to action, how the page fits with other sections and so on. Content strategists use page tables as a way to pass explicit instructions to content creators, so the wider strategy is implemented as intended. Copywriters can also use page tables purely as a device to ease the difficult journey to FINAL copy. Rather than overwhelming reviewers with full-on copy, you can get acquainted over a page table. Tease them with content requirements. Tantalise them with your thoroughness and consideration of their key messages. Subdue them with content, because only then can you woo them with style. Once reviewers have seen and signed off the page tables, agreeing the precise content for each page, you can write copy. And because stakeholders have been involved, they’re much more likely to love it. This page table looks like it would work like a charm. Getting people to participate in the process and documenting what you’ve agreed upon is always a smart move. Thanks you so much for this page table document. Great idea. It’s like a brief. I wrote creative briefs at the ad agencies, so having something like this will clarify objectives.